The rule I came to understand for using bias frames was this: Temperature-regulated cameras don't need them when the dark frame exposure time and temperature match those of the light frames. In other words, bias frames are useful only when you're trying to match dark and light frames that differ in exposure time or temperature. Is this really true? Some people say it's not, and that bias frames should always be used. My experience seems to agree. But is there a way to verify this? That's what I tried to do with some simple analysis using my SBIG ST-8300M CCD camera. I started by shooting twenty three-minuted dark frames at a temperature of -25C. Ten of these I set aside for later testing. The remaining ten were combined using three different methods (average, median, min/max exclude average). The result was three master dark frames, one for each common method of combining dark frames. I then shot twenty bias frames at -25C. The ST-8300M's shortest exposure time is 0.04 seconds, so that's what was used. These were averaged to create a master bias frame. Next, the ten dark frames that were set aside (it's helpful at this point to think of them as light frames) were calibrated with each of the master dark frames, both with and without the master bias frame. This created six sets of calibrated frames. 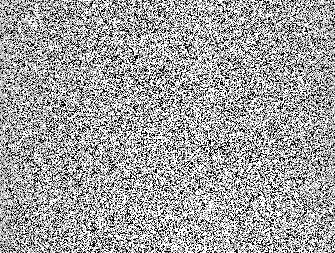 Noise in processed images. Top table: noise present when the master bias frame is used. Each column is for a different dark frame combining method (AVG = average, MED= median, MME = min/max exclude). Each row corresponds to a different "light" frame stacking method (WMED = weighted median, S255 = sigma clipping at 2.55 standard deviations. The row of numbers below each column is the column average. 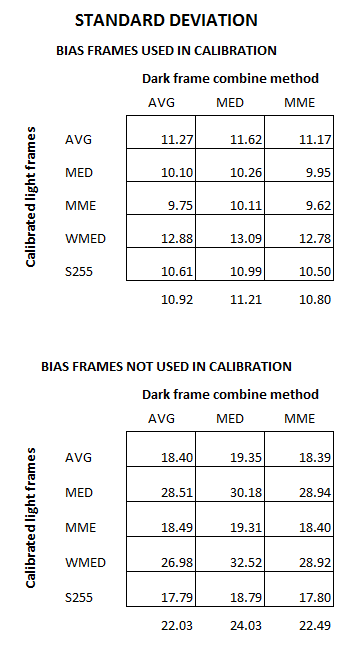 Bottom Table: as in the top table, but the calibration was performed without the master bias frame. The results show that the exclusion of the master bias frame roughly doubled the standard deviation of the pixel values! 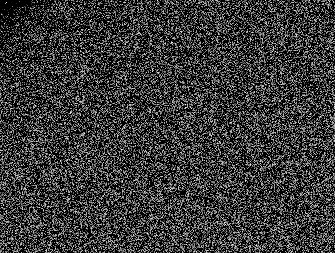 The images below show a comparison between the lowest noise (using min/max for dark combine and light stacking and bias for calibration) and the greatest noise (using median for combine and stacking, with no bias information). ImagesPlus digital development was applied equally to both stacked images. Worst case: Median combine and stack, bias not included in calibration. The lowest noise levels corresponded to combining dark frames using either an average or a min/max exclusion method and then stacking light frames with the min/max exclude method. Because both dark and light frames can be contaminated by cosmic rays, it makes sense to use some sort of rejection combine method in their processing. Both median and min/max perform about the same when the bias information is included. When the bias frame information is not included the min/max method clearly outperforms the median method. I think that from now on I'll always use bias frames!